There's only one way to eat popcorn in Chicago. 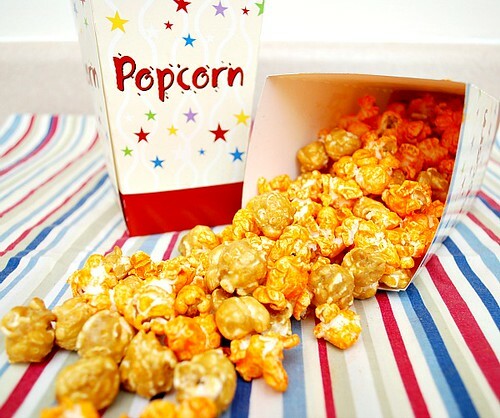 Here, we like a balanced combination of sweet and savory popcorn and to achieve this, we combine cheddar cheese popcorn with caramel popcorn. Sound weird? Maybe to some... but in Chicago, it's the norm! A favorite and popular place to get this sweet and savory concoction is at Garrett's Popcorn. With a few locations in the Chicagoland area, it's no surprise you'll find long lines of anxious folks waiting for a taste of their 'Chicago Mix' popcorn. The Chicago Mix is that cheese and caramel combo that everyone loves the minute they try it. If you had enough of cheese and want something sweet, grab a handful of caramel corn. If you need to give your sweet tooth a break, grab a handful of cheese popcorn. Before you know it, you've completely devoured the bag of popcorn and you'll understand why it's so good. It's truly the best of both worlds. Because my friend Jessica of The Jey of Cooking is such an avid Chicago Cubs fan and she's expecting her second child in a month, I hosted a very special All-Star Virtual Baby Shower for her. All her favorite bloggers teamed up to join in this delicious party highlighting ballpark fare. So be sure to check out the round up of what everyone made! My contribution to the party is popcorn. Every ballgame has popcorn available but since I am in Chicago afterall, I need to represent how we do it here. 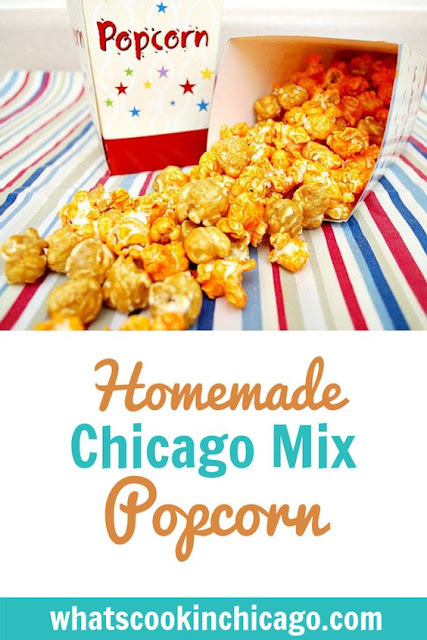 For a homemade Chicago Mix Popcorn, all you need is cheese and caramel popcorn. You can certainly use store-bought popcorn but the real fun is in making it from scratch. I used a cheddar cheese powder from another Chicago company, The Spice House. Another alternative is using Penzey's cheddar cheese powder as well. The caramel corn is a bit more time consuming but well worth the effort. So give these two popcorn recipes a go, combine them in a big bowl and start munching on the Chicago Mix! In a large bowl, combine the butter, cheddar cheese powder, mustard powder, cayenne pepper and the popcorn. Season with salt and pepper, to taste and toss to combine. In a medium saucepan over medium heat, melt butter. Stir in brown sugar, corn syrup and salt. Bring to a boil, stirring constantly. Boil without stirring 4 minutes. Remove from heat and stir in soda and vanilla.